1. 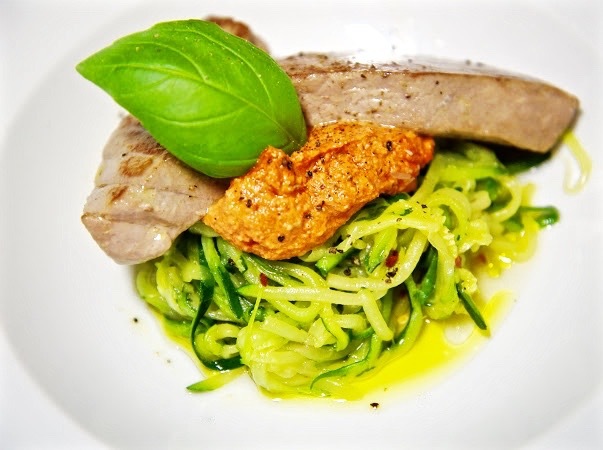 Using a spiralizer or vegetable peeler, start spiralises the courgette and set aside. 2. On a pan fry, heat up 20g of olive oil. Once ready, sizzle the tuna steak for 8 min each side on high heat. Remove from pan and set aside. 3. Using a wok, heat the remaining oil; add in the MLJ chilli sauce, courgetti, lemon juice, salt and pepper. Toss and cook for 8 min at medium heat. 5. Decorate with a large basil leaf before serving.